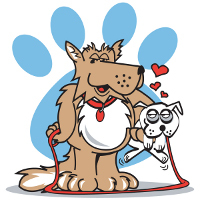 Black Star Kennels (BSK) is a free online dog game for people of all ages. It gives dog lovers a chance to breed, show, and raise their own dogs while chatting with other people of similar interests. BSK hopes members will learn responsibility for their dogs, money management, and social skills in a fun and entertaining environment and that these values will be instilled in future generations. BSK opened in 2005. It is designed, maintained and programmed by design1online.com, games for girls. It has gone through three different layout changes in the past few years and is steadily gaining in popularity. It is currently run by Dusty, one of the first players of BSK. This game is free to join and play. If you decide you like it you can upgrade your account for a small yearly fee. Upgraded members get additional features that makes playing the game more interactive and removes the restrictions regular members have on their accounts. For more information on upgrades please visit our upgrade section. We support and promote local humane societies and dog rescue groups and societies for the prevention of cruelty to animals. We hope that BSK will instill responsibility and life skills in people of all ages, as well as educating dog lovers to prominent animal rights issues. For more information on how to adopt a homeless dog or sponsor a special pooch in need please visit our animal rescue section.